Rattler #1 for you all to enjoy. I have been an Arts and Crafts camp counselor since 1984. This past summer I thought it would be fun to make an underground newspaper with our campers age 8-15. I wanted to give our photo department a boost with a ‘zine project mixed with a class in making comics. This way campers could draw, photograph, write, and create games, and have it all bound together into our own magazine. 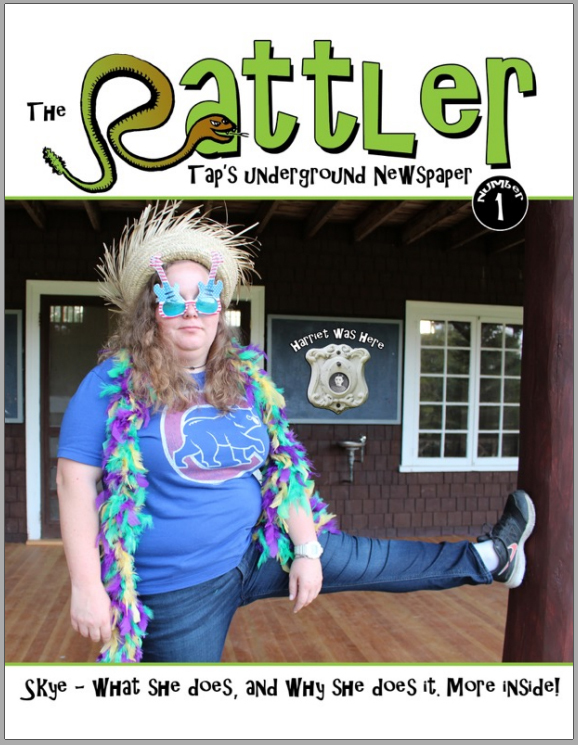 Our camp already has an official yearbook called The Tattler, so we called our project, The Rattler. Those that contributed became Vipers interviewing counselors at picnic lunch, drawing snarky cartoons during rest hour, and Photoshopping things that never happened. Here is our first fun filled issue from summer 2017.